Like you, Christians throughout the ages have faced challenges. 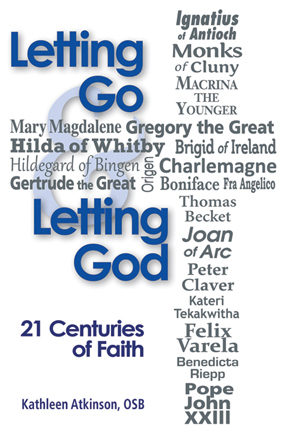 In Letting Go and Letting God: 21 Centuries of Faith, Kathleen Atkinson, OSB, illuminates the defining moments in their lives and how they show us the way to a more trusting relationship with God. Sister Atkinson examines the lives of holy people from each century, who strove to listen to the still, small voice of God. Then, taking courage from God's nearness, each person let go and let God work through him or her. With biographical commentary, reflection and prayer, Sister Atkinson helps you connect with each of these holy people and take away wisdom from their examples. God is calling you to join this cloud of witnesses. This is your century. As God leads you to witness to his goodness and love, listen to him and let go of all that holds you back. Let God lead you through difficulties to abundant life in him. Letting Go & Letting God. 21 Centuries of Faith is available at your local bookstores, on Amazon, ebooks, Liguori Publications and Annunciation Monastery.